Following Santa Marta, we took the bus to Cartagena. This time we actually went to a legitimate bus station, knowing only that the bus to Cartagena departed every hour and that tickets could be purchased on board for 21.000 COP ($10.50 USD) As soon as we arrived, we were whisked onto a waiting bus, and took the last two seats available. I took the lone seat by the front door. I had low expectations for the bus, so I was pleasantly surprised to see that the seats were very comfortable and that there was AC! The drive had just begun, and I was about to close my eyes for a little nap when I hear “Cartagena, Cartagena… Cartagena, Cartagena…” That singsong phrase is permanently imbedded in my memory, as I heard it for the next several hours! The assistant (much like the assistant on the bus ride from Tayrona to Santa Marta), was leaning out of the open doors of the bus, calling out to various people along the way, looking for more passengers. Along the route, people hopped on and stood in the aisle – for a reduced rate, I assume – and the driver just let them out wherever they needed to go. Next thing you know, one of the guys who just got on the bus sets up shop in the aisle, right next to me. He opens up his bag and proceeded to hawk handmade leather bags! On a bus! He was very descriptive, explaining each and every model, from the zippers, to the straps, to the designs. 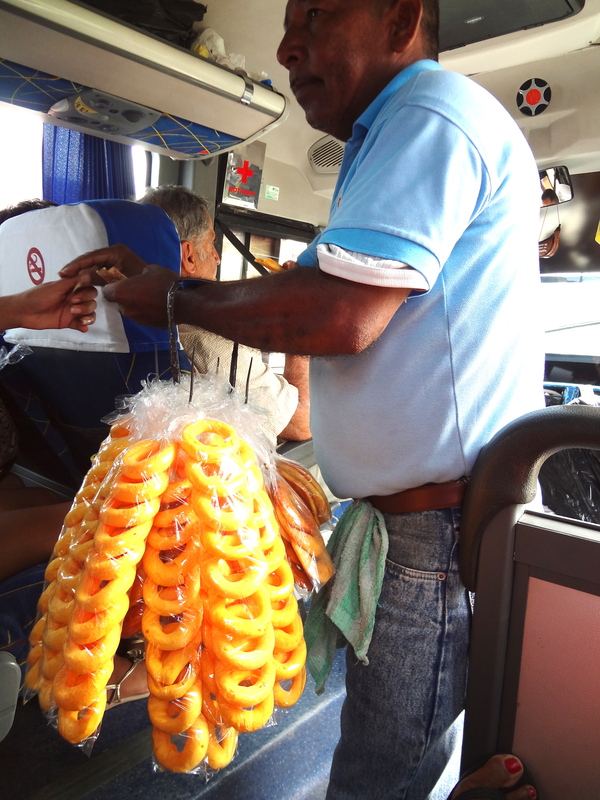 He then handed every person on the bus a small leather change purse* (see footnote), as a “promocion;” basically a buy one get one free deal. He then went to up to each interested person, selling his wares. After about 30 minutes, he thanked everyone and got off the bus. Ahhh… peace and quiet! Do you have any mocha frappuccinos? 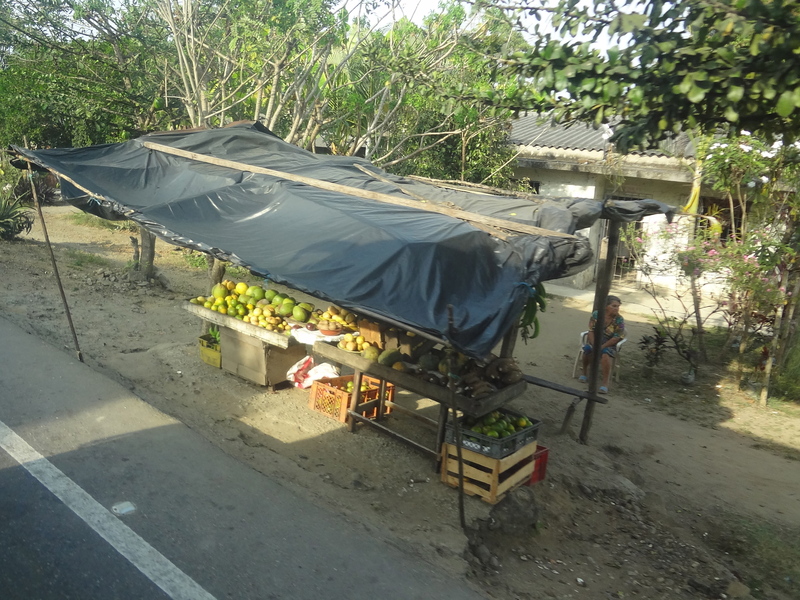 But a few minutes later, we stopped at a roadside stand and a couple guys got on selling snacks! One guy had bagged fruit juices (everything comes in bags here! ), and another guy sold circular shaped, home made snacks. I have seen these everywhere around here, and while I’m curious, I’m didn’t really want to try them. Especially whilst on a bus! Everyone buys their snacks and the salesmen leave the bus, and I drift off for a while. Then we stop to let a young woman off at a small roadside village. First she hands her baby to an older woman (grandma?) and gets back on the bus. Then she carries two big duffel bags off the bus. Followed by a large garbage bag, a high chair, a suitcase, and a queen size mattress! Homegirl basically just MOVED using a local BUS! Can you imagine if people did this at home? I should have moved out of Manhattan via the MTA and Bolt Bus… could have saved a lot of money! I honestly don’t know how they fit all that stuff onto a full bus. But the driver was very helpful in assisting her, and no one was impatient about the amount of time it took. Honestly I was just amazed and impressed! At some point after that, a guy got on and started speaking to everyone, but I couldn’t understand everything he was saying. I believe he was doing a magic show of some sort? I just pretended to be asleep at that point! Four hours after we began the journey, we ended up in the Cartagena bus station! So there you have it. 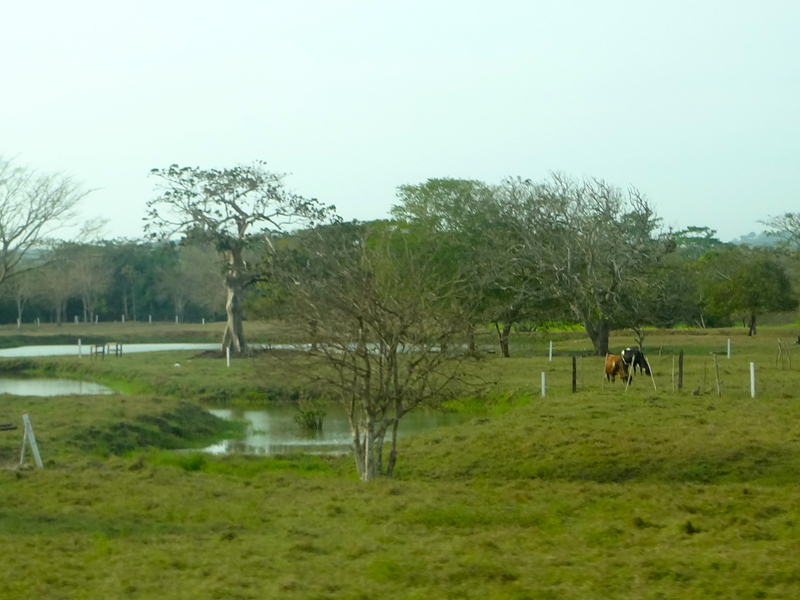 A full account of the bus ride from Santa Marta to Colombia. Comfortable, yet very loud and interactive! *Footnote: I rode the bus with Diana in Bogota. A man got on, presumably selling snacks, and handed bags of chips to everyone. I said “No, gracias,” but she took a pack. I assumed she was going to buy them, but she handed them back when the man returned. Apparently the etiquette is to accept the item, even if you don’t want it, in order to be polite and give the impression that you are actually considering a purchase, instead of simply dismissing the person. I thought that was interesting! Such was the case with the leather change purse mentioned above. Since I didn’t purchase a bag, I returned the change purse to the seller when he returned down the aisle. Uh, I’ve lived that scene so many times. The bus rides. I love the early morning ones when the guys bring on arepas de huevos, etc. The street food is so delicious there. I’ll be watching here for stories of whatever happens in Cartagena while there. Take care! I love stuff like that… unexpected ways to learn about other cultures! My Favorite part was the girl that moved on the bus!!!! Queen sized mattress are you kidding me. Colombia is a beautiful country. The food is always exciting while learning about any country. The true test is if the food still tastes good after being there for a year or more. The arepas get a bit hard:) As far as the Western Hemisphere goes, I would take Mexican or Peruvian food hands down over any other food. I really liked the way you told your story with the pictures. It was fun and interesting the whole way through. Thanks for sharing!! Thank you so much for the kind words, Lucas! I agree with you, the food is a great way to experience the culture. Three weeks in, and I’m still loving the arepas – my favorite is the choclo!